4 of the best high-res audio systems | What Hi-Fi? Whether you want to listen to high-res music on your mobile or on your desktop, or you want to build a separates or even multi-room hi-fi that supports high-res audio, we have a system for you. The good news is you don’t need to fork out exorbitant amounts of money to benefit from high-res audio. There are some perfectly sensible set-ups around, parts of which you may already own. On this page you’ll see our suggested high-res audio set-ups for various situations: desktop, multi-room, mobile and traditional separates. We start off with the desktop kit: a computer, a DAC, and a pair of headphones. Here we’ve used an Apple Macbook Air but any computer will do as long as it is capable of handling high-res files. (It’s worth noting here that iTunes is not able to handle FLAC files, though there is after-market software that can rectify that situation for you.) Your laptop will also need the ability to output audio via USB. Which leads us to the next part of this simple system, the AudioQuest DragonFly v1.2. This is our favourite affordable DAC, offering astonishing sound-for-pound value in a package the size of a memory stick. It can play files up to 24-bit/96kHz, with higher-resolution files downsampled by the computer. The DragonFly is simple to use, with a single 3.5mm output and compatibility with Apple Mac and PC alike. Just add headphones and you’re flying. The headphones we’ve chosen are the Philips Fidelio M1 MKII, another of our Award-winners. They’re comfortable and portable, but most crucially they offer a fun, refined listen with detail aplenty and impressive precision. Multi-room audio has really boomed of late. Sonos’s monopoly is no more, with brands old and new throwing multiple hats into the ring. Our favourite affordable choice is Bluesound, from some of the folks who pioneered hi-fi company NAD back in the ’70s. What you get is ease of use and high-resolution audio (up to 24-bit/192kHz) combined in one impressive system. We begin with the Bluesound Vault, which is an all-in-one music server and CD ripper. It offers 2TB of storage and the ability to rip CDs in FLAC, all without a computer. It happily incorporates other music stored on your network (say, on NAS drives). 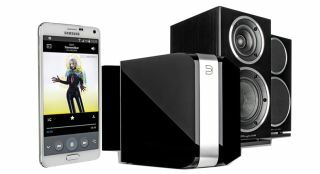 The Bluesound Powernode is a standalone, stereo streaming music player with a built-in digital amplifier. Its job is to take your music from the Vault. It’s worth remembering that streaming high-res audio over wifi is pretty bandwidth-intensive, so consider hard-wiring the Powernode with an ethernet cable. Outputs cater for stereo speakers and a subwoofer. Into the Powernode we would plug a pair of Wharfedale Diamond 220s. These are top-class budget speakers: they sound excellent, delivering meaty bass with far more power than we expect from a boxes only 32cm tall. Yes, you can go high-res on the go. While there are a quite a few standalone portable high-res players, they aren’t always the most affordable. However, many flagship smartphones these days are capable of handling high-res. So if you’re getting a smartphone anyway, there's an argument that you might as well get one of these and avoid having to carry another device. Take the Samsung Galaxy Note 4. It’s a pocket multimedia monster, and a great portable media centre. Besides its massive screen, it also offers support for FLAC files up to 24-bit/192kHz. Its sound is enthusiastic, with admirable rhythm and drive. It’s balanced and detailed. Pair this with the AKG Y50s: well-built cans with insight, good timing, impressive clarity and punchy dynamics. Their design may be a little flash, but you also have a choice of blue, yellow, or black. There are good arguments for desktop, multi-room or portable listening, but for us nothing beats a good sit-down with a traditional separates system. What we’ve assembled here arguably provides the best sound you can get for £1650. Your source here is the Pioneer N-50A. It’s a new network audio player, with many tricks up its ample sleeves. It can take virtually any file format you can throw at it. Connections are varied, offering local and web-based streaming goodness, as well as physical inputs (optical, coaxial, USB). All that, and it sounds fantastic too. If you’re after network streaming, this ticks many, many boxes. We’d connect that to the Arcam FMJ A19, the brilliant integrated stereo amp that took home a Product of the Year gong at our 2014 Awards. Its build and connections are impressive, but not as much as the big, room-filling sound. You get bags of subtle, revealing detail, as well as strong dynamics and remarkable composure. Top it off with the B&W 685 S2s. These Award-winners really are a superlative pair of standmounters, with an authoritative, thrilling sound and remarkable agility.